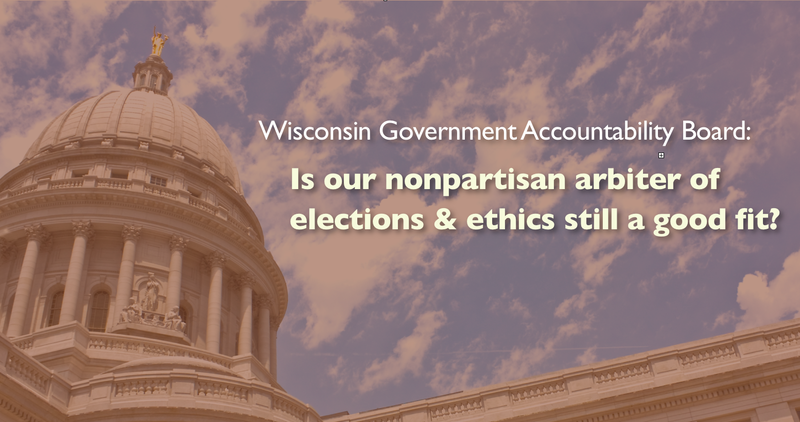 Is the Nonpartisan Wisconsin GAB Still a Good Fit for Us? Is this in the best interest of Wisconsin citizens? Join us to hear several perspectives on this important issue and to share your views! independent Wisconsin Government Accountability Board in 2007. Now? may have prevented Scott Walker's defeat in 2012 recall election. 3. Redistricting Reform Petition now exceeds 1,000 signatures! Have you signed it? 1. Earlier this year, Governor Scott Walker, State Senate Majority Leader Scott Fitzgerald and Assembly Speaker Robin Vos declared all out war on the non-partisan Wisconsin Government Accountability Board (GAB) because they hate that the GAB has done exactly what it was established to do in 2007 – respect and adhere to the law governing Wisconsin's election, campaign finance, ethics and lobby law. Walker, Fitzgerald and Vos particularly despise the fact that the six retired judges that comprise the GAB voted unanimously in 2012 to authorize an investigation into possible illegal campaign coordination between Scott Walker's campaign during the recall election, with outside special interest groups (Wisconsin Club for Growth and Wisconsin Manufacturers & Commerce). Never mind that the law against such coordination was very clear at that time and the GAB decision was completely in accordance with established law. What really irks Walker, Fitzgerald and Vos is that the GAB is not controlled by them and has not done their bidding. And so now, this Fall, the Republican majority will move in September to eviscerate the independence and non-partisanship of the GAB and attempt to ram through their own legislation that will make the GAB a partisan tool firmly under their control. In doing so, the GOP will seek to dictate the outcome of Wisconsin elections, campaign finance law, ethics and lobbying law and manipulate it in such a way that they will gain permanent political power and control in the clean, honest, accountable and nationally-admired state formerly known as Wisconsin. 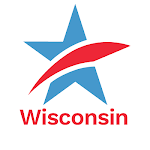 CC/WI worked very closely with legislators – primarily Republicans – in devising and working to advance and establish the GAB, which finally occurred during a Special Session of the Legislature in January, 2007 when it was enacted into law. The GAB replaced the discredited, hyper-partisan State Elections and State Ethics Boards, that had utterly failed to uncover, identify, investigate and prosecute the rampant corruption that was occurring under the Capitol Dome during the late 1990's and that culminated in the Legislative Caucus Scandal and the criminal charging of top State Senate Democratic and Assembly Republican leaders in 2002. 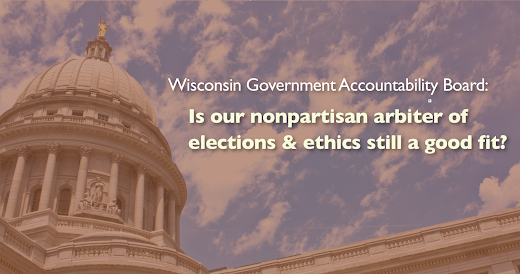 Both Republicans and Democrats in the Wisconsin Legislature fully realized the need for a strong, non-partisan state agency that had the ability to independently investigate corruption in state government. And after months of negotiations, in which CC/WI was intensely involved, the GAB was approved by a unanimous 33-0 vote in the State Senate and by a 97 to 2 vote in the State Assembly. Every Republican legislator in both chambers supported establishing the GAB. But now, Fitzgerald and Vos – who both voted for the GAB – have reversed their position because they cannot tolerate the fact that the GAB doesn't do their partisan bidding. Now, they think they have the votes to destroy what they helped create just eight years ago – even if they have absolutely no justification for doing so. Here is the complete listing of the 24 Republicans who voted to establish the GAB in 2007 and are still in the Legislature. Half of the 12 current GOP State Senators who voted for the GAB back then, were in the State Assembly at that time. And then there are 12 other GOP State Representatives then and now. Assuming no Democratic State Senators or State Representatives are stupid enough to support the Republican plan to destroy the GAB, these 24 Republicans need to be reminded that they should not abandon their 2007 support for a non-partisan entity that enjoys the confidence of the vast majority of Wisconsin citizens and the admiration of national experts on American elections. Contact them, as well as your own State Senator and State Representative. Tell them to keep their partisan hands of the non-partisan GAB! 2. The integrity of Milwaukee County D.A. John Chisholm in adhering to the John Doe secrecy order in 2012 may have saved Scott Walker from defeat in the 2012 recall election. And yet Chisholm has been viciously and vilely attacked by Walker minions for doing what he is supposed to do to uphold the rule of law. Both former Milwaukee County D.A. E. Michael McCann, now on the CC/WI Board, and CC/WI Director Jay Heck comment in this excellent Brendan Fischer article about the very latest in the John Doe controversies that will not die, despite the herculean effort of Walker, his minions, the four impossibly compromised and conflicted conservatives on the Wisconsin Supreme Court, the Wall Street Journal editorial board and many other guardians of the corrupt status quo. 3. CC/WI is again playing a lead role in promoting and advancing non-partisan redistricting reform in Wisconsin this year. The "roll-out" of the legislative component will begin in earnest next month (stay tuned for details!). Our petition to state legislators urging them to support redistricting reform legislation, Senate Bill 58, which is modeled after Iowa's terrific, non-partisan redistricting process, recently passed the 1,000 mark! Please urge your family, friends and neighbors who have not yet done so, to sign the petition and help us reach our 5,000 signature goal! Thank you. Savor these spectacular Wisconsin Summer days while they are with us still! More Special Treatment for Wisconsin Politicians?